Kolhapur is known for its hot and spicy Cuisine. Kolhapuri masala is made with dry red chiliies, coconut and lot of spices. I had some authentic ready masala powder that was sent to me by a cousin living there. You can prepare it at home as well. I have shared the link of the recipe in the post. Delicious veg and non veg dishes can be prepared with this masala. Today I have made mixed vegetable curry. You can use any vegetables of your choice. This can be served with plain rice or bhakri. 1. Heat oil in a pan and add garlic paste. Saute. 2. Tip in the finely diced onions and saute until translucent. 3. Next add the tomato and cook until it is soft. 4. Tip in the mixed vegetables of your choice. Add turmeric powder and salt. 5. Saute for a minute and add 2 cups of water. 6. Cook until half done and add the Kolhapuri masala powder. Stir it and simmer to cook. 7. When almost done add the coconut milk. 8.Stir carefully and adjust the gravy to your liking. What a lovely recipe with kholapuri masala loved the way you have given step by step pics to understand the recipe better, it helps those who are new to cooking, lovely share. Thanks for your complimenting words.. so happy dear.. Always wanted to try kolhapuri dish, couldn't get kolhapuri masala. Here I have a masala recipe as well to try. I am saving this recipe. Kolhapuri masala lends a typical spicy taste, aroma and beautiful color to the dishes..the curry looks very delicious di ! Thanks Poonam.. it is a treat for spicy food lovers. Dish looks so yummy! I have to check out the Kolhapuri masala recipe too; will try this soon! We love to eat a variety of curries from different parts of our country and this is another winner! Thanks for sharing dear! Thanks Vanitha.. I am also like you ..always wanting to try out new recipes. Too spicy and tempting. Loved your recipe, you explained it so well through pictures...bookmarking it..will try it soon!! Thanks for the compliment Jolly. Simply wow. Love this dish & you have just made me so crave about it now. Should head to my kitchen & recreate this dish following your recipe. Yum yum. Thanks Piyali.. so happy to hear that. Do share the feed back. Such a lovely recipe, it will be ideal with a hot phulkas. Nice share. Thanks Jayashree.. It goes well with rice too. Such a lovely recipe from kolhapur...... Awesome share surely ...loved the way you have given step by step pics to understand the recipe better !!! 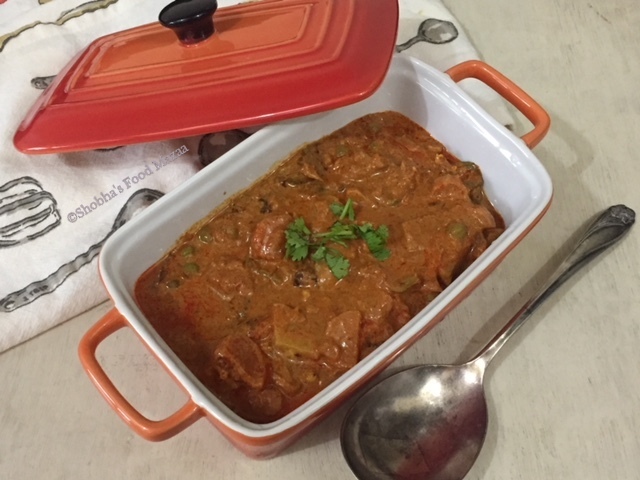 Wow, I can't thank you enough for sharing this recipe and also of the Kolhapuri masala. I have always wanted to try this and now I can, following your recipes. The masala looks so full of flavours, it would be just perfect with rotis. Welcome Praneetha... yes it is always a blessing to know the recipes of traditional masalas so that we can make them at home. Delicious! We did relish these spicy gravies in the past. Now we eat a lot milder food. But still will make it when hubby is not there. I also make it only when hubby travels on work.. he eals milder food but I love spicy dishes. Dish looks absolutely delicious and yum yum. Perfect side dish for rotis. Wow I love spicy food. And this looks delish. Thanks for the detailed recipe. Awesome share. Thanks sujata.. I am glad you liked it. When I was young and didn't know much about cooking, couldn't understand that the kind of spice mixture made all the difference to a dish. Now I do and love to make the mixture at home. A delicious looking sabji. True Mayuri.. specially after coming into blogging I also have learnt a lot. mixed vegetables looking lip-smacking. a perfect side dish with roti and rice. The Kohapuri masala gives the curry such a rich colour. It makes a simple mixed veg curry look exciting. Love it and will be making a batch soon. So glad you liked it and do share the feed back when you make it.